Football is a simple sport. It is why it has taken hold in so many disparate cultures and environments across the world. All you need is a ball, or an orange, or a squashed drinks can. And any sort of space - a yard, a wall, a street or field. Its administration should be equally simple. Apply its laws. Organise its competitions. Do so with efficiency and equity. Instead, the back room has become the bloated court. Those with the straightforward task of steering the globe's most popular and well-funded sport have left it wrecked on the rocks, an unholy mess of corruption, bribery and kickbacks. It's Gianni Infantino's job to put things right, following the 45-year-old lawyer's election as Fifa's latest president. That the governing bodies of so many sports have found themselves mired in the same distressed state is less a defence than a denunciation of the way so many have failed to cope with the commercial windfalls of the modern era. Because sport has never been so rich, never been so alluring to corporate sponsorship, never held the same possibilities for political advantage by autocratic or unpopular regimes. With that power and opportunity has come temptation. Temptation has too often been followed by weakness and venal self-interest. Fifa, with 14 of its current and former officials and associates on FBI charges of "rampant, systemic, and deep-rooted" corruption, its long-term oligarch Sepp Blatter banned from all football-related activities for six years and Michel Platini, the man who was supposed to clean up after him, banned for the same in the wake of an ongoing Swiss criminal case. The International Association of Athletics Federations was eviscerated by an independent commission which found "corruption was embedded" in the organisation during former president Lamine Diack's 16-year reign. Three of its senior officials were banned for life for alleged doping breaches and Russia was suspended from all international competition for its alleged involvement in widespread doping. The International Cycling Union, under former president Hein Verbruggen, found by a 227-page report released in March 2014 to have colluded with disgraced cyclist Lance Armstrong to cover up his positive dope test at the 1999 Tour de France. The International Olympic Committee, in the run up to the Winter Games at Salt Lake City, expelling six of its members for taking hundreds of thousands of dollars from officials behind the city's bid in 2002. The International Cricket Council, formerly run by N Srinivasan, who was banned from running his own national governing board by the Supreme Court of India. Administrators should not be in the headlines. They are not the stars and they are not the reason we supporters are drawn to the sport. But some, rather than acting as their sport's servants, have instead lived like princes: first-class travel, five-star hotels, expense accounts and grace-and-favour apartments. That's the legal stuff. The dark matter is as breathtaking in its audacity as in its scope. There is, of course, an alternative. And should Fifa be in need, after Friday's elections, of a simple mnemonic to ensure this fresh start does not end up rotting as the regimes of the recent past, they need only think of football, with a capital 'F'. An investigation by the Guardian newspaper in December 2014 found that Nepalese migrants building the infrastructure to host the 2022 World Cup had died at a rate of one every two days that year, despite Qatar's promises to improve their working conditions. Football, supposedly the beautiful game, can only be tarnished in the eyes of many when its governing body allows its showpiece occasion on such grim foundations. The IOC recovered from the Salt Lake scandal, changing the way the bidding process worked for future Olympics, capping the amount IOC members could receive from potential host cities. The UCI under Brian Cookson separated its anti-doping arm from the main organisation and established an independent tribunal for doping cases. Football supporters across the world will expect a similar metamorphosis from Fifa if it is to regain their trust. 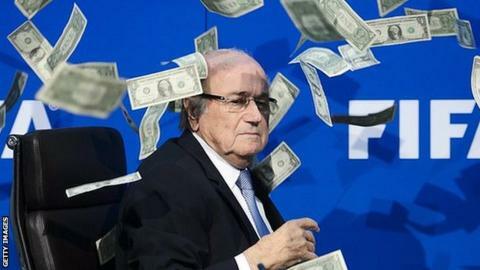 Fifa has never revealed Sepp Blatter's salary as president. Nor has it revealed the individual salaries of the members of its all-powerful executive committee. By contrast, the IOC, whose executive members are volunteers, now publishes exactly how much each receives in allowances and per diems. The example has been set. Fifa's election was once again a secret ballot. It should be the last. Its reforms promise an independent audit and compliance committee. The cynics would point to what happened to the investigative branch of its much heralded ethics committee, whose chairman, former United States attorney Michael J Garcia, resigned in protest when the publication of his report into the bidding process for the 2018 and 2022 World Cups was blocked by another part of Fifa. Fifa has been an organisation run by ageing men in plush corridors. All nine of its presidents have been male, so promising a minimum of six women on a new 36-member executive council is only a start. A game loved by all cannot be run by only a chosen few. Until now, Fifa has been responsible only to itself. As a self-governing body, it could virtually do as it pleased. No more. Too many too powerful organisations, from the FBI to Swiss criminal investigators, have seen too much. The old system of self-policing is gone. The 2014 World Cup cost hosts Brazil an estimated US $4bn (£2.8bn) to stage, yet Fifa made more than $2bn (£1.4bn) in profit from the tournament. Its cash reserve has leapt over the past decade from $350m (£228.6m) in 2005 to more than $1.5bn (£1bn) in 2014. It is enough to transform the game at grassroots level. Allow it to do so and Fifa would win hearts as well as minds. Blatter ran Fifa like an emperor, a Swiss sun king immune to regime change or challenge for far too long. Infantino has so far refused to criticise the outgoing man - "I respect very much all the work he did in terms of football development around the world," he said earlier this month - and also refused to reveal his salary as Uefa's general secretary. Now he has the throne, such guarded diplomacy and politicking must be superseded by governance through untouchable example.